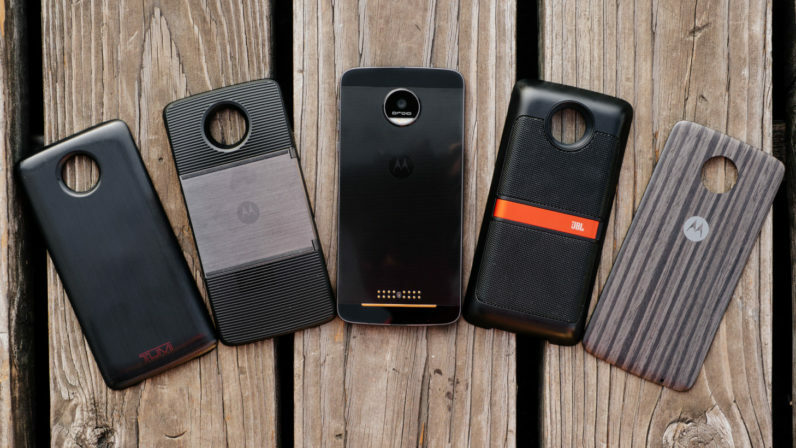 After the LG G5‘s lackluster reception and Google scrapping Project Ara, Motorola’s Moto Z line seems to be the last hope for modular phones. Of course, that won’t work if you don’t have any mods to use, but Motorola says it’s hoping to deliver a relative onslaught of them next year. According to Phandroid, the company plans on releasing Mods more quickly than it did in 2016, aiming for four new ones per quarter. Sixteen Mods is a pretty hefty number, but we’ve already seen multiple concepts from Motorola, such as a secondary display or more powerful cameras. One of the Mods launching next year may even be a legitimate spec upgrade, adding a 5G radio for next-gen data speeds. In the meantime, the company just launched two new Mods for the Z series, including a 3,000 mAh Mophie battery (larger than the previous 2200 mAh ones), and a car dock by Incipio. The company plans to encourage further community development with an Indiegogo campaign. That all sounds fine and dandy to me, but the phones have been held back by Motorola’s exclusivity deals with Verizon. The best version of the Moto Z, the Z Force, is only available on Verizon in the US, and even the standard version was only released unlocked well after the Verizon launch. Motorola has a lot of potential with the Moto Z and their Mods, but first it’s going to have to make it easier to let people get their hands on them.